The analysis of 1959-2009 data revealed that population density and proximity to a country already experiencing an outbreak were the factors most closely associated with a country’s own likelihood of experiencing an outbreak. “As a geographer, I was glad to see that the first law of geography held true, which is that things that are near each other tend to be more alike,” said University of Illinois pathobiology professor Dr. Marilyn O’Hara Ruiz, who led the research with pathobiology professor Dr. Rebecca Lee Smith and former postdoctoral research associate Gianluigi Rossi. 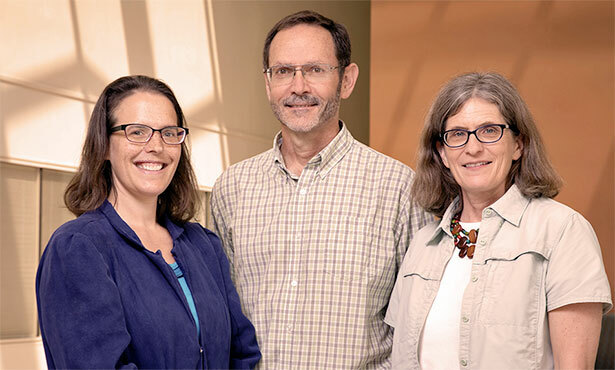 The graphics above and below were created by William Marshall Brown, standing in the center in the featured photo, between Dr. Rebecca Smith (left) and Dr. Marilyn O’Hara Ruiz. 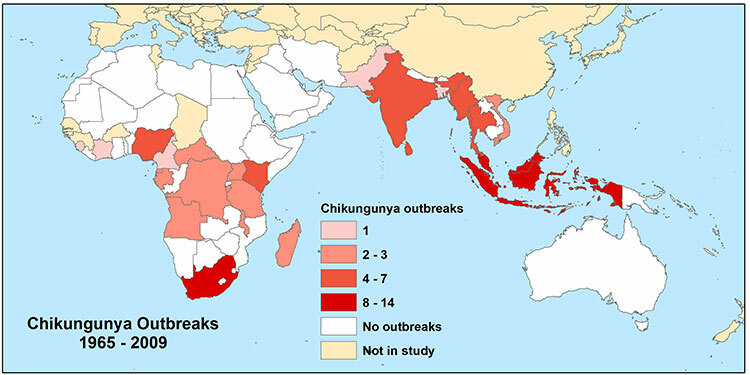 Chikungunya and dengue are mosquito-borne viral diseases with overlapping distribution globally. Dengue can be a more serious infection, with a mortality rate of about 20 percent for severe infections that go untreated. 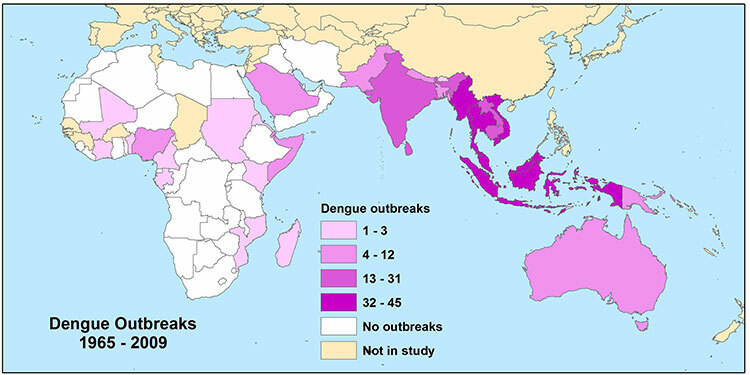 Dengue infections are on the rise globally, according to the World Health Organization. Both diseases are more likely to occur in tropical or subtropical regions. The new study found no significant association between local temperature or precipitation and outbreak risk, a somewhat unexpected finding since heat, rain and fluctuations in mosquito populations are often linked, the researchers said. The findings should reassure those who worry that distant outbreaks will travel across the world to strike closer to home, Dr. Ruiz said. 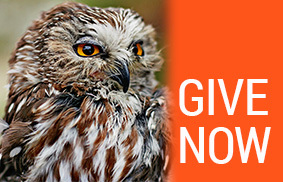 “If one is trying to reduce the spread of an infectious disease, it’s probably better to focus resources on places that have high-density populations and that have an outbreak nearby,” she said. Another important implication of the work is that countries need to share data with their neighbors, Dr. Smith said. The study is reported in the journal Spatial and Spatio-temporal Epidemiology.